Use the gears in different combinations front and rear to reduce torque twist in the rear and overdrive the front axle to help pull you through climbs easier . The heavy duty gear set offers improved gear mesh reducing slop in the drive train. 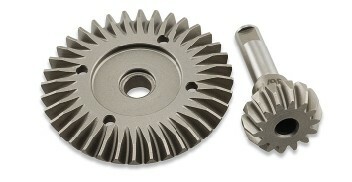 Spiral cut gears offer increased gear tooth contact and run quieter. New gear ratios offer a low gear and high gear range. The lower gear range set reduces torque twist (43/13). The higher gear range offers higher top speed (36/14). Hardened steel for increased strength and additional weight in the axle. One set per axle required. Laser etched markings. I think when combined under/overdrive (front & back) makes a bigger difference than just overdriving the front!